Carlos Tevez has denied reports that he became the highest paid player in world football when he swapped his boyhood club Boca Juniors for the Chinese Super League. The Argentine international was unveiled by Shanghai Shenhua on Saturday and later trained with his new team-mates for the first time. But during his first press-conference the 32-year-old quashed claims that he is earning £615,000 per week at his new club, although the figure has been widely reported across the globe. He said: ‘After my last game I didn’t mention anything to the local media about my salary in China. ‘Salary matters shouldn’t be told to everyone, it’s a matter of respect for my team-mates. 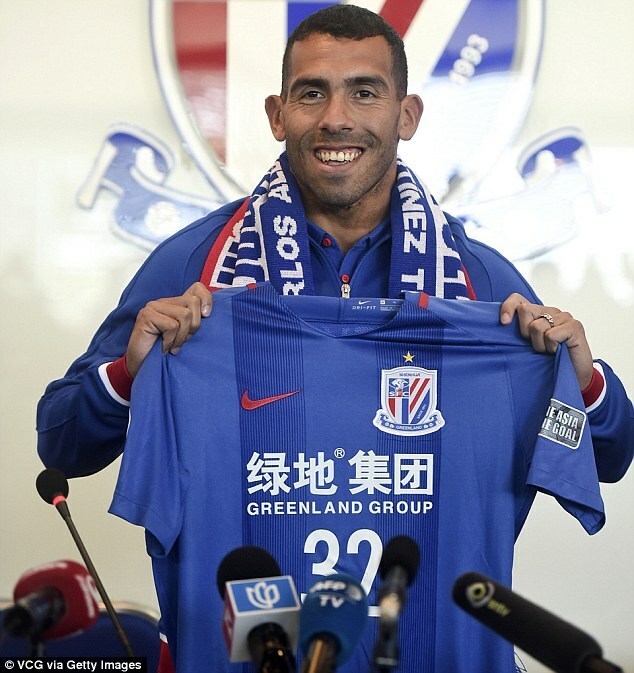 Tevez arrived at his new home on Friday to a rapturous reception and became the latest big-name player to move to China after Oscar and Axel Witsel. He will join a squad that already boasts former Newcastle and Chelsea striker Demba Ba, and the Colombian international Fredy Guarin among its top stars. Tevez, an Argetina veteran with 76 appearances for his country will play alongside 28 nationals in the Chinese team, who have managed just 60 caps between them. *All estimated figures are pre-tax, except in these cases where figures are post-tax. Sums may vary according to bonus payments. He accepts that moving to the far east will bring pressure but insists that he will rise to the challenge. ‘There will probably be pressure, but because I love football very much I will use my passion for the sport. Even if there will be pressure I will forget about it on the field,’ Tevez said.